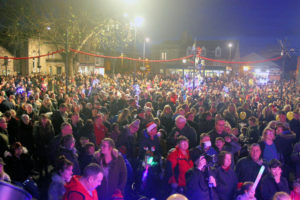 THOUSANDS of people from far and wide flocked to the Market Place last weekend to marvel at the town’s magical Christmas lights switch on. And yet again, Melksham’s Christmas lights display is being hailed as one of the best in the West Country, with mountains of praise directed at the team of volunteers responsible for the spectacular show. 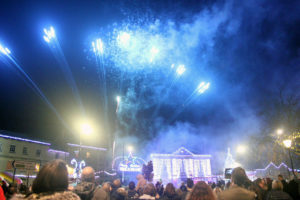 Speaking to the Melksham News, mayor cllr Adrienne Westbrook said, “Again Melksham leads the way in the West Country, demonstrating how to put on a fabulous Christmas lights display. The lights are magnificent! “Once again our volunteers are the most amazing people going. I can’t give them enough praise – there aren’t enough words to describe the amazing work that they do. The lights have gone down well with loads of compliments on social media. “Our Christmas lights in Melksham are fantastic, the best in the region. Knocks spots off of Bath’s lights who seem to put up the same every year. Our volunteers who donate their time and energy to make this happen are amazing and we are so grateful to you,” said Maureen McCourtney on the Sham Shoutouts Facebook page. “Totally agree. They all work so hard. In all wind and rain. They do an amazing job and do Melksham. proud. Best around. Well done everybody involved,” agreed Margaret Brooks. “Melksham is lucky to have them (volunteers),” said Vicky Gingell. “Melksham should be really proud of their achievements. Definitely the best in the south west. Far better than I’ve even seen in Bristol and Bath,” said Dee James. Helping the three lucky children chosen from the crowd to turn on the lights were mayor, cllr Adrienne Westbrook; the High Sheriff of Wiltshire, Nicky Alberry; local MP Michelle Donelan and Anna Weymouth, wife of Christmas lights volunteer Paul Weymouth. Mayor cllr Adrienne Westbrook added, “The town council is proud to help support the Christmas lights volunteers with grants. We are also delighted to pay for the Christmas tree and the security on the night, helping to keep the town safe. Also on the day, crowds of people browsed stalls in the Assembly Hall and Market Place, whilst enjoying performances from Manor Primary School choir and Melksham Music and Drama. There were fairground rides and games for children in the Market Place, visits to Santa’s grotto in the Town Hall and live music from local group The Decibelles, to bring the festivities to a close. Please click on the picture below to be see the Picture Special on our digital edition.